Curled up and dead to the world, a cat's life seems ideal. That was the case until his loving owner (me) threw on the sound of Gorillaz. This is no word of a lie and it?s not just a half-witted metaphor? my cat stirred, his ears tweaked and then he jumped up to stare at the speakers. Who knows what he must have thought. Then again, I wonder what his contemporary ancestors in the jungle must be thinking of Gorillaz like these? Unless you?re my cat, I suspect you?ve heard the single Clint Eastwood * - if the title doesn?t ring a bell, it is that bloke from *blur singing ? ?I?ve got sunshine in a bag, the future is coming on??. It is the most accessible track on this album. I wasn?t sure what to expect about the rest of it. For some reason I thought Mr.Albarn had only done vocals on the single, but it seems that just about every track, but not all, have his distinct chic-cockney tones/drones (bias dependant on your love/hate of his voice). So the rest of the record? As a whole it is, shall we say: ?a little different? but with an underlying, unacquainted feeling throughout. It?s a sensation you get with someone you think you?ve already fallen in love with after walking past them a few times. Each track seems to have it?s own characteristic. I guess if you whirled the idiosyncrasies of: the blur back-catalogue with some old skool hip-hop á la Grandmaster flash and some avant-garde breakbeat electronica (especially stuff like Cornelieus and Kid Koala that Damon?s always bangin? on about in MTV interviews! ); the storm in an industrial strength coffee cup, would probably resemble something like this self-titled Gorillaz record. There are big trumpets, squeaky electronic bleeps, lyrical flows, strange samples (like the repeated echoing yells of ?Hello! Is anyone there?? on album closer ?M1 A1? ), guitars of different volumes, distortions and type, plus lots of dirty bass pouring out the bottom end. This doesn?t really sound like any hip-hop, breakbeat or electronica record to me, I now know why my cat looked so intrigued. Throughout, there seems to be an arrogant optimism that this record will float to the top to change the world. Maybe it will. But the strands of Damon?s consciousness are a little too buried in the beats and asphyxiated by the abnormal vocal sounds, for the thought portions to really make me think (maybe I need to give it time). In it?s defence where this album has not instantly filled my mind with revolutionary desire - like the single did - it really does have places that make me want to dust off those dusty b-boy boots and get down with my two left funky feet. Although in other, mainly the quieter places, it seems to lose me. I don?t think I get lost because of the direction the songs go in, it just totally loses me somehow - especially on ?Latin Simone?. The feeling I get is that the band vanish into their own world under the sea. Maybe that?s it. Maybe this is what a band playing under the sea might sound like. 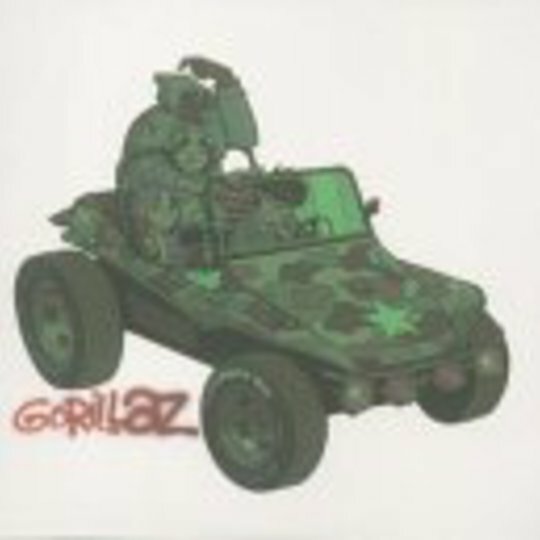 Though, Gorillaz don?t have gills, do they?! If you?re looking for a record to get ready to hit the town to, then this may be it. Then again, the more chilled out tracks seem like those moments where all you want to do is sink into the pillow and reflect upon something-or-other. I?ll leave the decision to Lotti, my cat, he is on his third listen now and is just beginning to look little less interested. At least he?s not sleeping for the first time in a while.